That old LCD down problem has come back and it's worse than ever!!! It normally reconnects straight away but I can have loads of LCP down errors spaced out over just a few minutes and I am now starting to get them in the day! I did ask to be capped at 4MB but he insisted 6MB I mangaged to get him to cap me at 5MB in the end! Router has not been up long so will check my stats later on tonight as thats when the trouble starts. I have called and requested to be capped at 4MB as that should be more than enough! Waiting for a call back so I guess it will never happen!! Last edited by acoolwelshbloke; 15-07-07 at 02:07 PM. No I am not wireless, I have PC connected via ethernet port 1! CRC errors tend to show in the evening, I get great speeds in the day even before I was capped at 5MB but when the evening came my snr dropped to 4 below! As we know this is not good so capped at 5MB solved that! I now have around 15db in the day and around 9db or above in the evening! So why am I now getting problems in the nights with LCP down??? Only thing I can think of is to cap me at 4MB and see how that goes, if problem is still there then it has to be a sky problem? It's not the router, I have tried it with the generic firmware as well as with sky's own! I have tried replacing the router with a linksys and BT voyager but same problem! my line at the moment is fine apart from these LCP down issues that happen late evening or through the night! Speeds are fine, snr is fine, so other than trying to get it capped lower there is not much else I can do??? 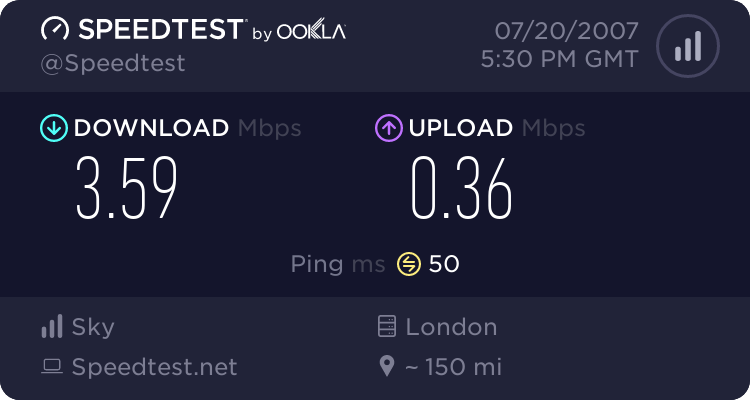 Ohhh just to add when I was on connect BT told me as well as sky that my line could only handle 4 - 4.5MB but now I am on sky's MID package sky seem to think my line can support up to 6MB? Hense the reason why he wanted to cap me at the six meg and not the five meg in first place! I am sure I need to be capped at 4MB but try telling that to support! Last edited by acoolwelshbloke; 15-07-07 at 02:27 PM. tbh id do it in a second if u got through to me, especially if ur asking for it! you need to get hold of a useful tier 1 agent who'll pass you through, again id recommend later on in the evening as it's easier to get through. of course, it's ur call but line stats would suggest you don't need the cap - but it's worth a go i suppose! There is another ticket open, I have many tickets lol! I will try again tonight, will not reboot my router so any errors will be shown! I will call after 11pm as I was told to do so by the last helpfull scottish guy! May get lucky, although I can't understand why my line quality gets worse the later in the evening it gets! Well as you can see, my stats are looking good! Infact they have never looked better, maybe teir 2 contacted teir 3 like they said they would do earlier today and they did something. However I better wait till the morning before I know for sure!